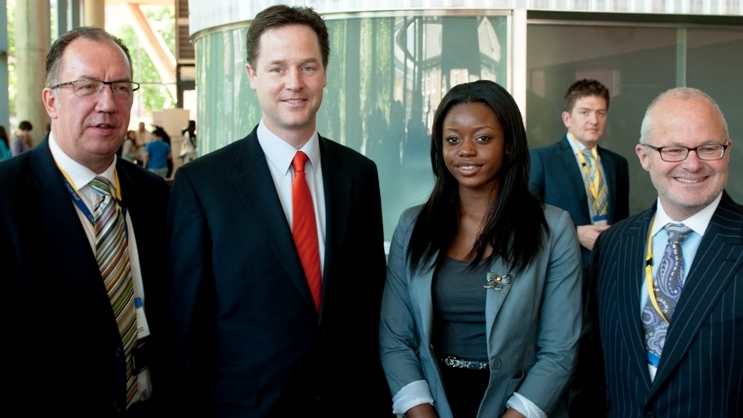 Liberal Democrat leader, Nick Clegg today gave his first major speech as deputy Prime Minister. He breezed into City and Islington College with his newly appended entourage to speak to 75 hopeful students in an impoverished area of North London. Mr. Clegg in an impressive and broad sweeping speech on democratic reforms promised to repeal legislation that curtail civil liberties such as the DNA database and ID cards; reform political party funding and the voting system, and push for a fully elected House of Lords; and radically redistribute power by cutting quangos and advocating an English Parliament. The speech was heavy on ambition and content. Critics will point out that many of the proposals were limited. They will say the voting reform option tinkers only at the edges of full proportional representation; that a fully elected House of Lords will politicise an already effective and cross party chamber; that cutting red tape and agencies harms bodies like the ECHR that fight equality. It’s clear the new deputy PM is affable and humble in power. His speech showed a quiet determination and belief in getting things done as part of a coalition, and at times what must be a testing set of circumstances. It was somewhat disappointing that after the positive introduction by the Union president students were consigned to the margins. Not a single question was asked of any student despite a student college being the host. To make matters worse Clegg prefaced his Q&A saying ‘I’ll take questions from students’ and then proceeded to take questions solely from the Westminster lobby fodder or from NGO’s. If questions had been asked there would have been more of a context to the news coverage of students booing outside the college before and after. They were protesting over the drop of Clegg’s opposition to tuition fees and the abolishing of EMA’s. A new politics should be about engaging speeches. It should be about engaging young people on student issues too. Absolutely fantastic speech I thought!